About a month ago me and Holden were at the park and met some very nice people: Rhonda and her almost 2 year old daughter, Gabrielle. We started to talk and found out we had a lot in common. We are both 21, both have toddlers, and are both stay at home moms. We decided to meet up every now and then so the kids could play and we could socialize a bit. It had been a while since we had hung out because both of us had been busy with going out of town. Today Rhonda and Gabrielle came over to our house. The kids drove us crazy screaming (Yeah Holden taught Gabrielle that lovely high-pitched sound *rolls eyes*) but they had fun, so that's all that matters, right? LOL. Holden and Gabrielle are both in that wonderful 2 year old stage of that's-my-toy-and-you-better-not-touch it so there were a few fights but all in all they got along pretty well. I even snapped a picture of them sitting at Holden's table. Aren't they cute? HAHA.. I have been majorly slacking with laundry. Okay not just laundry, but bathrooms, bedrooms, kitchen.. you get the idea! I haven't been feeling the greatest, so these chores have taken the back burner. It's starting to show by my son's attire. Last night his "pajamas" consisted of a onesie (that he's had FOREVER), some dorky lookin' pants, and to top it off a pair of mis-matched socks. Nice, huh? At least he's showing his patriotism. LOL. This next week I'm determined to get my house back in order. First on the list is............. LAUNDRY. It's going to be an all day project. Eek! 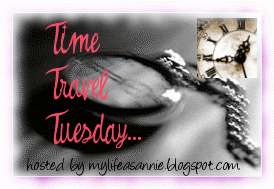 I thought I would participate in My Life as Annie's Time Travel Tuesday. I'm making time travel incredibly easy this week! We've traveled all over our lives and today we are going to travel to yesterday. If you live in the US, you probably celebrated Labor Day in some way... even if it was just staying home for the day. What did you do yesterday, who did you spend time with? What was the highlight of the day? Were there any disappointments? Hmmm.. nothing very intersting went on yesterday. Matt was home since he gets off on Labor day. So that was nice. We went and looked at furniture for Holden's big boy room. But we're broke, so we're just looking for now. We're thinking about getting a bunk bed but the neurotic person inside me isn't completely sure I'd feel comfortable with that. I tend to worry a little.. okay a lot. Anyway, back on track.. After that we went home and ate lunch. We played a little bit then Holden went down for his nap. Matt was very hyped up about a college football game (Texas Tech vs. SMU). So he watched the game... and I watched an SVU marathon. I love that show. After Holden woke up I talked Matt into cooking dinner. He cooked spaghetti- that is the extent of his cooking capabilities. But it tasted pretty good!! The rest of the night we just played outside, watched some t.v., and relaxed. All in all it was a pretty nice day. to get our children to eat! This evening Holden didn't want anything to do with dinner. He had brought some foam letters to the table. He dropped a couple and started to whine because he wanted us to pick them up. So we told him take a bite and we will give you 1 letter. To our astonishment he actually did it! Then he thought it was fun and kept doing it over and over. He would also give us a letter when we would take a bite. :-) For the first time in a long time he ate nearly all of his food. If only I had thought of this tactic earlier.